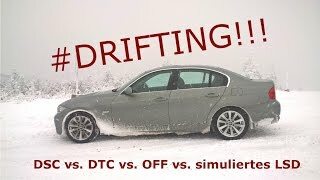 In this video you can see the different driving behavior between Traction Mode and DSC/DTC completely OFF in deep snow with BMW's all wheel drive system xDrive. The slope has an incline of 20%. WARNING: DO NOT USE DSC/DTC COMPLETELY OFF ON PUBLIC ROADS! New Goodyear Ultra Grip RFT Winter tyres in 255/50 R19 107V were fitted on the car in this video. CARS EXTREM In reply to Victor MC. Victor MC. No matter if it is Audi, VW, Mercedes, Porsche, etc, you need to switch off traction control, otherwise you get problems in these conditions. Адекватный Фанат BMW No, new Goodyear Ultra Grip RFT 255/50 R19 107V winter tires. Good tip but you had less snow on the second run. CARS EXTREM In reply to Jaakko R.
Jaakko R. Yes, but not much less. The second run was the morning after the night oft the first run. Over night it stopped snowing and the snow sank down. Georgi Aldev Thank you very much! You boiled the massage of the video down to an essence! MendezPresents Which is a good thing in my opinion. Everybody should experience a car without all helpers. 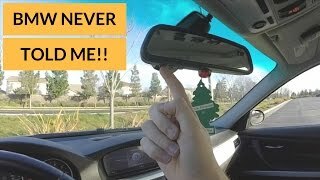 Today every new car has them and we start to lose connection to the car and our driving skills. MendezPresents Most People nowadays do not know, how a car behaves without ESC/ABS and how they have to react, if the car slides or get out of control. That is why I wrote this warning. Furthermore modern cars are a lot heavier than old cars, so they are harder to control in extreme situations. In modern cars you do not even recognize, when ESC is intervening and saves your axx. :) I had the case, that on my E83 X3 xDrive and DSC was broken. No ESC and ABS were working and I had rear wheel drive without traction control. If you drive the car like this, you start realise, how often DSC is intervening in normal driving situations and saves you. ΑΠΟΣΤΟΛΟΣ ΚΑΡΑΚΟΥΤΑΣ I have Goodyear Ultra Grip RFT 255/50 R19 107V winter tires mounted, but they are more for high speed german Autobahn, than for heavy winter usage. 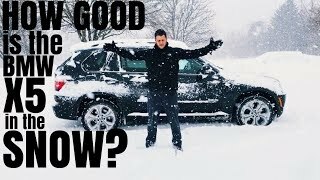 New Goodyear Ultra Grip RFT Winter tires in 255/50 R19 107V are fitted on the car in this video. You have to turn off the traction control and use the X drive. 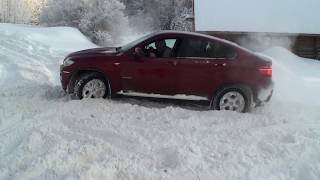 My 2013 x3 28i walks right up are hill that is worse than this. hirschj60 Yes, this is the massage, that I want to send to the people out there with the video. Please watch the video untill to the end. There you can see, how the car made it easy up the hill, with DSC/DTC deactivated. 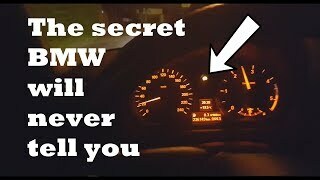 Reving the engine works (dsc doesn't let you)... tested on a RWD. It made a huge difference. I used to get stuck very often in deep snow, until once while I was driving the car was on TC and was bogging down. Then I suddenly remembered the hill clim buggies and how they go up hill and realized the TC/dsc was keeping wheel spin low, I long pressed the DSC turning it off, and off I went, not even it kept momentum but the car started to accelerate quite well. Just be careful with the steering. The theory is friction coefficient decreases with speed between surfaces (wheel spin faster or slower than the car moves) and has a sudden decrease when the surfaces start to slip (breaking traction). But this applies to materials in general. The friction force doesn't depend on surface area of contact. But this doesn't apply to surfaces covered with snow, mud or sand. For these grooves in the tires also matter and for snow and mud apparently you get more traction by reving up the wheels. anarhy09 You are right, but weather like this you have maybe 10-20 days in the year. The other 340 days I like to have a more sporty car. And this „lifestyle“ SUVs can fulfill this better in my opinion than the cars you have named. German Autobahn with 260 km/h is a hell of a fun in the X6. Clearly, if a car is good in going fast, it have to suffer in terms of offroad capabilities. Pour le ct cela devrait passer. On ne change pas le développement. jérome DOUSSOT I hope, that I understand you correctly, but from BMW the smallest size of tyres you can get for the BMW X6 E71 is 255/50 R19. For the X5 you can get 18“, but these does not fit on the X6. Ya know if you just shoveled and salted your driveway you probably wouldn't have any issues lol. CARS EXTREM I will attest to that. I have an 09 335xi and it's so much fun in the snow. I use snow tire on my two X3, the wife and I. With big thread. Not those winter sport crap. I learned that lesson on my old 328i. The dealer insisted on Pirelli winter sport. Worst tires I have ever had up here in Canada. Now I use Pirelli Winter Carving Edge. Never listen to the dealer that says you need speed rated winter tires. And be ready to go to a tire shop if there insistent on only being able to put speed rated tires on. 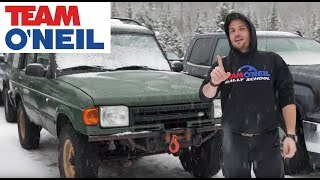 You need proper winter tires. It’s got to have big wide lugs to go through big snow. Paul L „Only“ a 40d, but I love it. 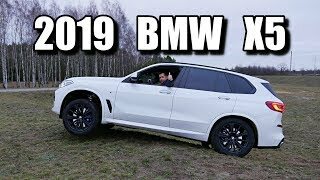 X6M is a beast, but in europe with the high gas price and taxes only as millionaire affordable. I hope you get a X6M some day and share your experiences with us. It is the hard work worth it! love love love the X6. Someday when the house is paid for I'll try to get the X6 M. You got a X6, your a lucky guy. Paul L Thanks! I will keep my X6 as long as I can. I bought it 7 1/2 years ago new and it is the best car I have ever had. People say cars are only a thing, but after a long time an emotional relationship is growing and they get a big part in our life. I wish you all the best too! Paul L I have now my second X3 E83. First I had the 2.0d, now I have the 3.0d (still searching for a 3.0si with manual gearbox, but it is hard to find one in europe). I love the E83. As my company car I have leased a F25 BMW X3 xDrive20d with manual gearbox, but I like the E83 more. The gearbox on the F25 is bad and not very smooth. No comparison to the manual gearbox of the E83. However the new G01 X3 is a completely new step forward. A much bigger step than from E83 to F25. Sadly no manual gearbox available anymore. I have read about the plastic gear in the transfer case. My Dealer meant, this could not be the problem. Maybe he lied. As I bought my X3 E83 3.0d last year, for the third time I had problems with the transfer case. I changed the oil of the transfer case, which did not helped. Then I changed the tyres (Discoverer Cooper Sport) against new Continental 4x4 WinterContact tyres (recommended from BMW) and since then up to today (5000 km and 3 Months) the problem is away. 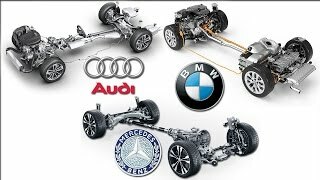 I do not know how to describe it right in english, but I have read, if the extend of all 4 tyres is not exactly the same, the transfer case constantly tries to compensate this different extend on the tyres, which confuses and quickens the wear of the whole system. BMW recommended tyres assure, that this extend is perfectly the same on all 4 tyres. Maybe this makes sense. CARS EXTREM In reply to Tomas Av. SeriousFox If DSC fails, because of a technical issue or if you unplug the fuse of DSC, then ABS also does not work. I had this case at my X3 E83, when the transfer case of xDrive was broken. But if you switch DSC off with the button in the dashboard, ABS still works. Belive me, I have tested. Maybe in the night snow was very soft, next morning, with the cold night, the snow was more hard an easy to run over. ASC off, DTC on, DSC on. PABLO JORGE I have read anywhere, that if you want to have a strict 50/50 power distribution at xDrive, like with a mechanical locker, you need to switch all systems completely off. Otherwise ASC/xDrive is constantly distribute the power to a different wheel to find traction. In my opinion, DSC completely off ( DSC press for 5 seconds) and full throttle will make the tires crazy spinning. Moreover, will allow half of the tire spinning with not actuation with the " electronic lockers" that these vehicle have. I'm not 100% sure, it is quite difficult make repetitive test, more in snow. PABLO JORGE Maybe, but the snow was quite similar. You can see that at the second attempt the wheelspin was not stopped, which did not take momentum to go up the hill. In my opinion this has helped a lot. Only ASC Off is unfortunately not possible. You can select between everything on, half on and completely off. You can get Goodyear Ultra Grip with BMW's '*' approval??. Any links? Good tyres - some are better in deeper snow etc would you buy the same again ? Richard Evans I bought them 12/2016 and had driven them at least 600 miles to this point. Subscribed and to note. I just bought a 535i GT(xDrive) yesterday. Illya Dixon Cool thanks! Sub back! :) 535i GT is a great car. It has a lot more room than the X6 and is clearly more luxurios. 35i is also a true BMW engine. Congratulations to the awesome car! First try: falling moist snow. In those contitions snow is at its most slippery state. Second try: snow not falling, dryer an colder. Much more grip. 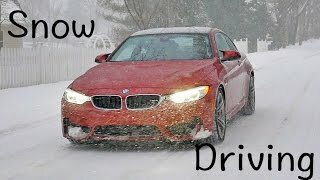 i like bmw but there winter ability isnt great due to the selection of tires available there mostly just sports tires which isnt surprising sporty car sport tire the tire ratio makes it hard to find good ones. Richard Evans BMW recommends some tyres and writes on them a „*“, which means they are BMW proved. Like Mercedes „MO“ or Audi „AO“ uses as labeling. You can mount which tyres you want, but if something happens, BMW uses every chance to avoid paying for problems during warranty as every manufacturer. andrew h Yes and if you do not take tyres, which are recommended by BMW, you can get in trouble with the warranty, if something brakes. 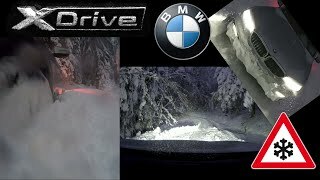 Last winter I took my x1 sdrive on dunlop winter tires 3d; through deep snow like this and after driving away the snow layer become a bit deeper, the car started to loose momentum, I was just about to bog dow with system on Traction mode. But then I long pressed the esc button and turn the dsc off, and it immediately began to pull. Keeping the rpm above 3000 rpm in first gear proved to work perfectly through 20cm of snow and like 10kmph due to very tight spaces. Dsc doesn't let the wheels spin fast enough, and in deep snow you need to do that for maximum traction. Of course if you are in a AWD car with winter tires you can go through either way. Driving at low speed, below 50kmph is easy with systems off as the car is predicable, but after you get past the bad road conditions you can turn them back on. I wonder if those who comment here have actually tested dsc off before speaking. Yes theoretically friction between surfaces reduces friction coefficient, but it applies to materials not to anything, and for snow there seem to be more factors involved. I think in mud the same thing happens. bmw520ds yes, that makes sense. 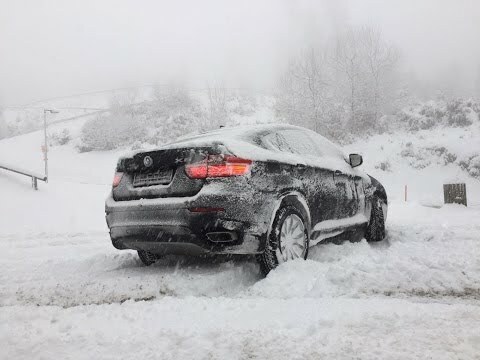 Because the DSC switches off the wheel, the centrifugal force throws away the snow adhering to the tire lamellas. That's why. inox1ck Thanks for your report! You are absolutely right! They need to try and experience it in real life. Then they would understand the different traction-mods and when it is better to use them and when not. Is it me or does that thing on the left look like a chimp face...? Illya Dixon At which minute? Cool Channel, you have my subscribtion. 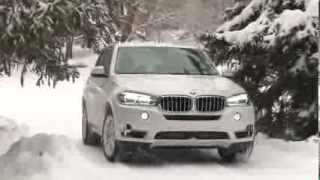 BMW Traction Control in Snow Demonstration | WARNING ! 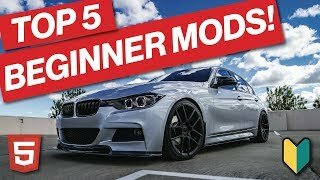 TOP 5 F30 BMW BEGINNER MODS | YOU SHOULD START HERE!!! 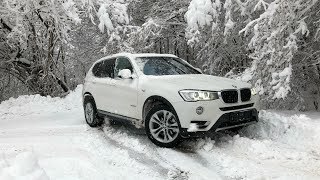 How Good is the BMW X5 in the SNOW ?